Labor & delivery is such an incredible time! We begin praying for the doctor/midwives & nurses who will be on call when we deliver very early on in pregnancy. They play such a crucial role and we are so thankful for all they do during one of the most important times in our life. What an incredible calling they have! We pray that it will be the RIGHT people, that God will give them wisdom, clarity, focus, and a sound mind. We pray for blessings, protection, & anointing over them. We also pray they will be believers, and that we (me especially) will allow Christ to shine through us to them so they give GLORY to Him (because yes, you can even be kind & Christlike during childbirth, and that’s an awesome testament to HIS strength & power). As a little thank you and token of our appreciation, we make little goody bags so they know how appreciated they are by the Butler family. We want them to KNOW they have been prayed for and that we believe they’ve been specifically chosen. Plus, I like to give gifts & I always want to be known as a grateful person. It’s important for people to know you appreciate them. We mostly put AdvoCare goodies in the bags because we want to share what we love (and duh, we LOVE Advo! ), but have put a few other things in as well. (So we have put in few different Spark flavors, Rehydrate, Advobars, a meal shake, a Slam, Oasis, gum, hand sanitizer, note pad, pen, etc.) I don’t think it really matters what’s in there- it’s more of the thought that counts. I’ve heard of people baking treats or bringing candy too. 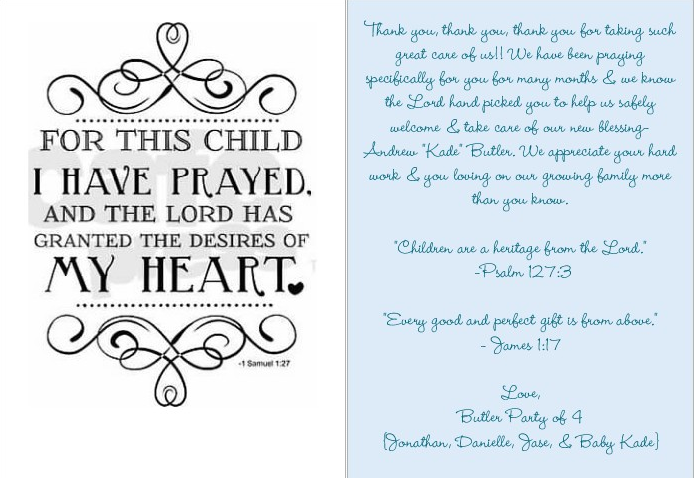 We also add a card I have printed from Shutterfly with a picture of our family. Here are the goody bags & cards I’ve made when we had each of the boys. And P.S. The prayers have worked! We’ve always had the best nurses, midwives, & doctors!! Feel free to steal away! I think it’s so important to let people know you appreciate them & are thankful for their hard work. Even a little note is a nice gesture & doesn’t take much effort.